The first set of two stamps of 1964 was issued on March 30 to join hands with the UNESCO to preserve the history and archaeological sites and Nubian Monuments in Egypt. The Nubian Monuments from Abu Simbel to Philae consists of the Temples of Ramses II at Abu Simbel and the Sanctuary of Isis at Philae. The turq blue and red stamp (above left) priced at Paisa 13 depicted the Temple of Thot, while the purple and black stamp (above right) with a face value of Paisa 50 showed the Abu Simbel temple. It may be mentioned here that the Nubian sites form part of the World Heritage Sites under protection of the UNESCO. 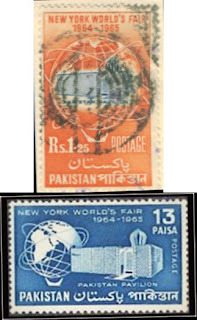 The second issue of the year consisted of a set of two stamps which was issued on the eve of the New York World Fair. The stamps were issued on 22 April 1964. The stamp in ultramarine red-ora colour on top above priced at Rs. 1.25 showed the Pakistani pavilion. 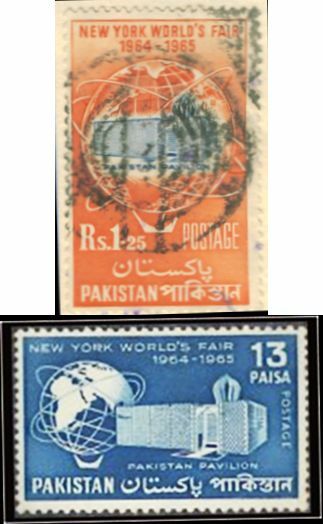 The Paisa 13 ultramarine coloured stamp (above bottom) also showed the Pakistani pavilion and the Unisphere. Shah Abdul Latif of Bhitt Shah in Sind Pakistan, also known as Shah Abdul Latif of Bhittai (1689 – 1752) was a great sufi scholar and poet of Sindhi language. As per Wikipedia, Bhittai's work has been frequently compared to that of Jalal ud Din Rumi and Seyyed Hossein Nasr, Professor of Islamic studies at George Washington University, describes Shah Latif as a "direct emanation Rūmī's spirituality in the Indian world." 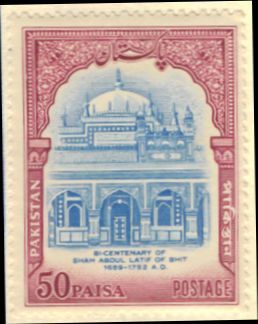 On the eve of the bicentenrial death anniversary of Shah Abdul Latif of Bhittai, a commemorative stamp showing his mausoleum was issued by Pakistan Post on June 25, 1964. 1964 marked the 16th death anniversary of Muhammad Ali Jinnah, the founder of Pakistan. 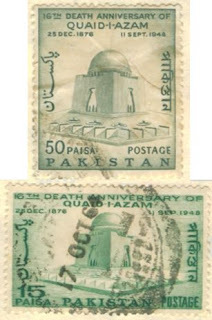 A set of two stamps showing the then under construction mausoleum of Jinnah, priced at Paisa 15 and 50 was issued on 11 September. The 15 Paisa stamp was emerald in colour, while the 50 Paisa stamp was in bronze green colour. On October 5, a stamp of 15 Paisa denomination was issued to celebrate the Universal Children Day. 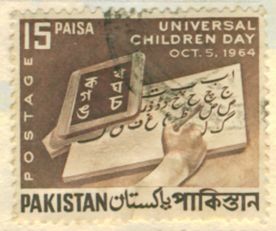 The brown coloured stamp showed two slates with Bengali and Urdu alphabets. 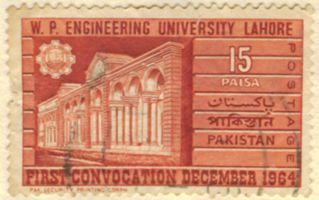 The last stamp of the year was issued on December 21 to commemorate the first convocation of the West Pakistan's University of Engineering Technology, Lahore. The largely red stamp bore the building of the university, which probably was the only engineering and technology university in Pakistan at that time. The stamp was priced at Paisa 15.